Reports are flooding in that pre-order demand for Apple's iPhone 5 was so severe, the company sold out of its initial supply within an hour of it going on sale at 12 a.m. PDT. U.S. shipping for the phone has also been pushed back by two weeks, meaning phones won't find their way into delivery trucks until Sept. 28, one week after the initial Sept. 21 shipping date. 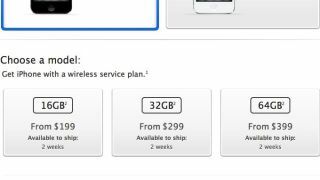 As of 8:45 a.m. PDT Friday, no change had come to the two-week shipping timeframe, though the UK Apple Store is showing a two to three week shipping time for the 32GB and 64GB models. Apple is reportedly giving pre-orderers the option of picking up their phone at Apple retail stores next Friday. Despite a somewhat lackluster response from certain fronts, the sixth-gen iPhone is apparently just what consumers want. According to TechCrunch, the iOS 6-packing smartphone sold out 20 times faster than either the iPhone 4 or the iPhone 4S, the latter of which was the first to welcome Siri into the mobile device lexicon. The volume of consumers on the Apple Store reportedly caused site problems like error messages to pop up. Another new Apple product, the Lightning-30 pin port adapter designed to let legacy devices plug into the new iPhone, has also sold out. That $29 (£18) accessory won't ship until October. Customers can still pick up the iPhone 5 in Apple retail tores starting at 8 a.m. Sept. 21, according to the Apple Store website. TechRadar has reached out to Apple for comment and will update this story if and when more information becomes available. Check back with TechRadar throughout the day for updated shipping times and availability.